Dakota is a 2-year-old dark brown/black brindle male with striking white markings, born July 13, 2001. 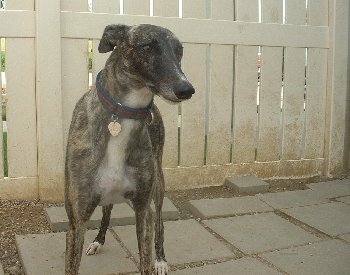 Dakota was turned into the Waco shelter, and GALT was contacted. Dakota's sire is Dominator and his dam is CK's Amy. Dakota is very, very handsome and extremely affectionate. He has an easy-going personality, gets along very well with other dogs and is cat tolerant.